This calculator determines the top speed of the vehicle with no margin for mechanical, rolling, or wind resistance. These resistance factors could make the top speed slower than the calculation. 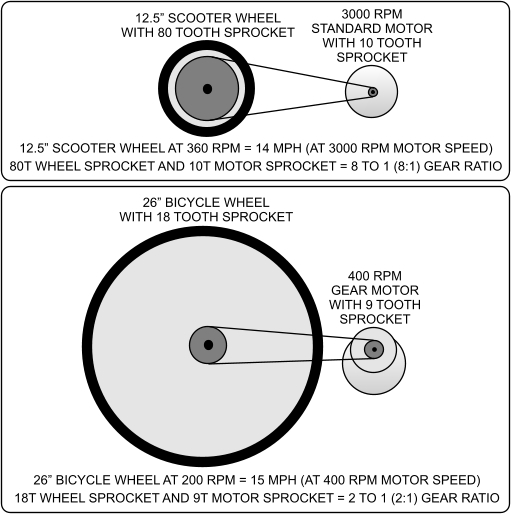 The amount that the top speed will be reduced by resistance depends on many factors such as the power of the motor, weight of the vehicle and rider, size and air pressure of the tires, incline degree that the vehicle is going up, and headwind. The top speed could also be increased above the top speed calculation by riding down hill, or riding with a strong wind against your back. This guide is for modifying, designing and building custom electric; scooters, bikes, go karts, ATVs, wagons and other similar light electric vehicles.